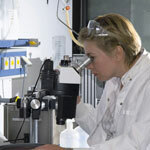 Whether it’s a microscope, computer program or lab technique, technology is at the heart of biomedical research. Credit: Stock image. Whether it’s a microscope, computer program or lab technique, technology is at the heart of biomedical research. Its central role is particularly clear from this month’s posts. Some show how different tools led to basic discoveries with important health applications. For instance, a supercomputer unlocked the secrets of a drug-making enzyme, a software tool identified disease-causing variations among family members and high-powered microscopy revealed a mechanism allowing microtubules—and a cancer drug that targets them—to work. Another theme featured in several posts is novel uses for established technologies. 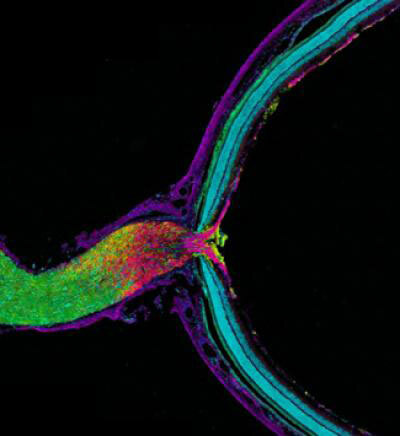 The scientists behind the cool image put a new spin on a long-standing imaging technology to gain surprising insights into how some brain cells dispose of old parts. Similarly, the finding related to sepsis demonstrates yet another application of a standard lab technique called polymerase chain reaction: assessing the immune state of people with this serious medical condition. This image shows the mouse optic nerve and retina. Credit: Keunyoung Kim, Thomas Deerinck and Mark Ellisman, National Center for Microscopy and Imaging Research , UC San Diego. In this image, the optic nerve (left) leaves the back of the retina (right). Where the retina meets the optic nerve, visual information begins its journey from the eye to the brain. Taking a closer look, axons (purple), which carry electrical and chemical messages, meet astrocytes (yellow), a type of brain cell. Recent research has found a new and surprising role for these astrocytes. Biologists have long thought that all cells, including neurons, degrade and reuse pieces of their own mitochondria, the little powerhouses that provide energy to cells. Using cutting-edge imaging technology, researchers led by Mark Ellisman of the University of California, San Diego, and Nicholas Marsh-Armstrong of Johns Hopkins University have caught neurons in the mouse optic nerve in the act of passing some of their worn out mitochondria to neighboring astrocytes, which then did the dirty work of recycling. The researchers also showed that neurons in other regions of the brain appear to outsource mitochondrial breakdown to astrocytes as well. They suggest that it will be important to confirm that this process occurs in other parts of the brain and to determine how possible defects in the outsourcing may contribute to or underlie neuronal dysfunction or neurodegenerative diseases. This work also was funded by NIH’s National Eye Institute and National Institute on Drug Abuse. The movement of this mutated enzyme, LovD9, facilitates rapid production of the cholesterol reducing-drug simvastatin. Credit: Silvia Osuna and Gonzalo Jiménez-Osés, University of California, Los Angeles. LovD9, a mutated version of an enzyme extracted from mold growing in soil, produces the cholesterol-reducing drug simvastatin 1,000 times faster than its natural predecessor. But scientists didn’t understand why because the enzyme’s mutations are far from the active site, where the drug is actually made. Now they do. Yi Tang of the University of California, Los Angeles (UCLA), in partnership with the pharmaceutical company Codexis, generated LovD9 by repeatedly inducing random mutations, each time selecting the mutated versions of the enzyme with the most promise for industrial simvastatin production. Then, the team collaborated with UCLA colleagues Kendall Houk and Todd Yeates to unlock the secret of the enzyme’s speed. Using ANTON, a special-purpose supercomputer at the Pittsburgh Supercomputing Center, they simulated how different parts of the enzyme rotate and twist when synthesizing the drug. 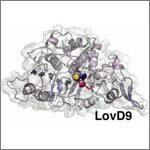 The scientists discovered that as LovD9 moves, it forms shapes that facilitate simvastatin production more often than the natural enzyme does. With their better understanding of how mutations far from an active site may affect an enzyme’s motion, the researchers hope to one day directly engineer enzymes with precise mutations that enhance drug production. A new software tool analyzes disease-causing genetic variations within a family. Credit: NIH’s National Human Genome Research Institute. Changes in your DNA sequence occur randomly and rarely. But when they do happen, they can increase your risk of developing common, complex diseases, such as cancer. One way to identify disease-causing variations is to study the genomes of family members, since the changes typically are passed down to subsequent generations. To rake through a family tree for genetic variations with the highest probabilities of causing a disease, researchers combined several commonly-used statistical methods into a new software tool called pVAAST. The scientific team, which included Mark Yandell and Lynn Jorde of the University of Utah and Chad Huff of the University of Texas MD Anderson Cancer Center, used the tool to identify the genetic causes of a chronic intestinal inflammation disease and of developmental defects affecting the heart, face and limbs. The results confirmed previously identified genetic variations for the developmental diseases and pinpointed a previously unknown variation for the intestinal inflammation. 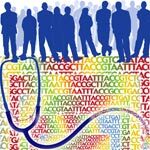 Together, the findings confirm the ability of the tool to detect disease-causing genetic changes within a family. Another research team has already used the software tool to discover rare genetic changes associated with family cases of breast cancer. These studies are likely just the beginning for studying genetic patterns of diseases than run in a family. This work also was funded by NIH’s National Institute of Diabetes and Digestive and Kidney Diseases; National Cancer Institute; National Human Genome Research Institute; National Heart, Lung, and Blood Institute; and National Institute of Mental Health. A new study finds that people with lingering sepsis may have suppressed immune systems. Credit: Stock image. Each year, more than 200,000 people in the United States die from sepsis, a condition caused by an overwhelming immune response that can quickly lead to organ failure. While many people with sepsis survive this immediate threat, they may die days or even months later from secondary infections. A research team that included Richard Hotchkiss, Jonathan Green and Gregory Storch of Washington University School of Medicine in St. Louis suspected that when sepsis lasts for more than a few days, it compromises the immune system. To test this hypothesis, the scientists compared viral activity in sepsis patients, other critically ill patients and healthy individuals. They looked for viruses like Epstein-Barr and herpes-simplex that are often dormant and innocuous in healthy people but can reactivate and cause problems in those with suppressed immune systems. Of the three study groups, sepsis patients had much higher levels of these viruses, suggesting that their immune responses may be hindered. Immune suppression could make it difficult to defend against the reactivated viruses as well as new infections like pneumonia. The team now plans to test whether immune-boosting drugs can prevent deaths in people with lingering sepsis. If he could recommend one book about science to a lay reader, it would be: “The Eighth Day of Creation,” about the revolution in molecular biology in the 1940s and 50s. At the turn of the 21st century, Rhiju Das saw a beautiful picture that changed his life. Then a student of particle physics with a focus on cosmology, he attended a lecture unveiling an image of the ribosome—the cellular machinery that assembles proteins in every living creature. Ribosomes are enormous, complicated machines made up of many proteins and nucleic acids similar to DNA. Deciphering the structure of a ribosome—the 3-D image Das saw—was such an impressive feat that the scientists who accomplished it won the 2009 Nobel Prize in chemistry. Das, who had been looking for a way to apply his physics background to a research question he could study in a lab, had found his calling. Das focuses on the nucleic acid known as RNA, which, in addition to forming part of the ribosome, plays many roles in the body. As is the case for most proteins, RNA folds into a 3-D shape that enables it to work properly. Das is now the head of a lab at Stanford University that unravels how the structure and folding of RNA drives its function. He has taken a unique approach to uncovering the rules behind nucleic acid folding: harnessing the wisdom of the crowd. Together with his collaborator, Adrien Treuille of Carnegie Mellon University, Das created an online, multiplayer video game called EteRNA . More than a mere game, it does far more than entertain. With its tagline “Played by Humans, Scored by Nature,” it’s upending how scientists approach RNA structure discovery and design. Treuille and Das launched EteRNA after working on another computer game called Foldit , which lets participants play with complex protein folding questions. Like Foldit, EteRNA asks players to assemble, twist and revise structures—this time of RNA—onscreen. But EteRNA takes things a step further. Unlike Foldit, where the rewards are only game points, the winners of each round of EteRNA actually get to have their RNA designs synthesized in a wet lab at Stanford. Das and his colleagues then post the results—which designs resulted in a successful, functional RNAs and which didn’t—back online for the players to learn from. In a paper published in the Proceedings of the National Academy of Sciences , Das and his colleagues showed how effective this approach could be. The collective effort of the EteRNA participants—which now number over 100,000—was better and faster than several established computer programs at solving RNA design problems, and even came up with successful new structural rules never before proposed by scientists or computers. 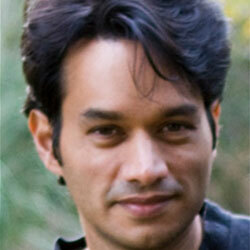 To capture lessons learned through the crowd-sourcing approach, Das and his colleagues incorporated successful rules and features into a new algorithm for RNA structure discovery, called EteRNABot, which has performed better than older computer algorithms. You can try EteRNA for yourself at http://eternagame.org . Das and Treuille are always looking for new players and soliciting feedback. A microtubule, part of the cell’s skeleton, builds and deconstructs. Credit: Eva Nogales lab, University of California, Berkeley. In this animation, tubulin proteins snap into place like Lego blocks to build a microtubule, part of the cell’s skeleton. When construction ends, this long hollow cylinder falls to pieces from its top end. The breakdown is critical for many basic biological processes, including cell division, when rapidly shortening microtubules pull chromosomes into each daughter cell. Until recently, scientists didn’t know exactly what drove microtubules to fall apart. A research team led by Eva Nogales of the Lawrence Berkeley National Laboratory and the University of California, Berkeley, now has an explanation. Using high-powered microscopy, the scientists peered into the structure of a microtubule and found how a chemical reaction puts the stacking tubulin proteins under intense strain. The only thing keeping the proteins from springing apart is the pressure from the addition of more tubulin. So when assembly stops, the microtubule deconstructs. The team also learned that Taxol, a common cancer drug, relieves this tension and allows microtubules to remain intact indefinitely. With microtubules frozen in place, a cancer cell cannot divide and eventually dies. Because of this research, scientists now better understand both the success behind a common cancer drug and the molecular basis underlying the workings of microtubules. Although invisible to our immune system’s antibodies, strains of a pneumonia-causing bacteria, Pseudomonas aeruginosa (orange), are easily detected by galectins. Credit: Centers for Disease Control and Prevention. When harmful strains of bacteria invade our bodies, our immune system produces antibodies that identify the intruders by the specific carbohydrate structures coating them. Some strains, however, have coatings that mimic the carbohydrate structures found on our own cells, and this disguise allows them to evade detection by antibodies. A team of scientists led by Richard Cummings of Emory University found that galectins, a class of proteins naturally produced by our bodies, can identify and kill these concealed bacteria without damaging our own mimicked cells. 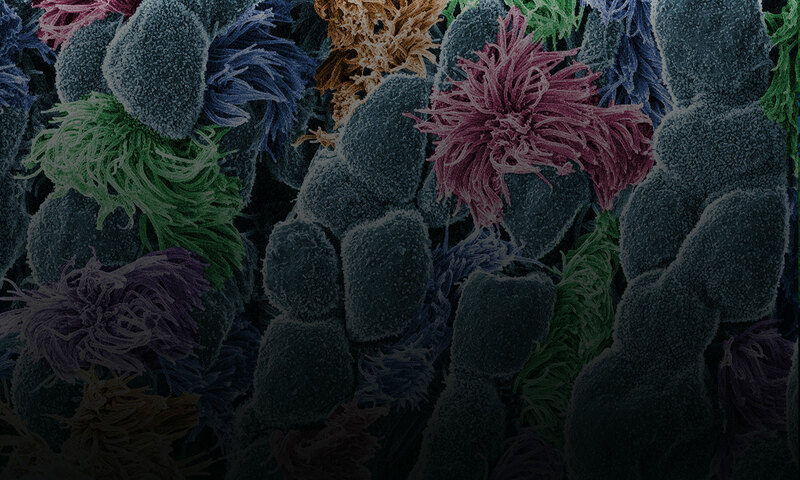 To make this discovery, the team used glass slides covered with more than 300 different carbohydrates extracted from the surface of bacterial cells. After testing the ability of galectins and antibodies to bind to specific carbohydrates on these slides, the researchers observed that the galectins easily detected the mammalian-like carbohydrates that the antibodies failed to recognize. These findings provide a clearer understanding of the complementary roles played by galectins and antibodies in protecting us from a broad range of infections. This work also was funded by NIH’s National Institute of Allergy and Infectious Diseases and National Heart, Lung, and Blood Institute.